Discussion in 'Norton Commando Motorcycles (Classic)' started by tomspro, Dec 4, 2014. About ready to put on new headers from CS. Got new nuts / crush washers and my threads seem OK, although one pipe was a bit loose when I removed it. Wondering if anyone sells, or has fabricated a double clamp support for the pipes in the area near where the headers meet the mufflers. Seems like this additional piece would go a long way to relieve stress at the exhaust port, perhaps saving threads from being bunged from vibration. I can picture somekinda pipe clamp-rubber-frame clamp type arrangement. Do search for double clamp exhaust unions that are all metal and also plumbing supply with rubber tube wrapped in corrugated Alu with jubilee-hose clamps on ends or make your own. Something in exhaust has to shift-give some or it fatigue breaks. As the union of mine wore out to point not to clamp worth a damn muffler rubber and header bend seem lasting happy though some soot around header end shows up. Don't know any such product but for sure the exhaust nuts provide more than adequate "support" at the head as they must be insanely tight without chance of movements after tightening. The engine in the subframe will be hopping about merrily so any support at the pipe to muffler area would need fixing to the subframe assembly I think. The real issue seems to be the muffler mounts which are fixed and take the divorced by distance hopping forces on rubber mounts that we all know eventually fail from vibrations. CNW has addressed this issue with spring mounts here instead of rubber. Maybe someone can talk about those . Quality springs I believe. Not sure I understand the problem. Once the muffler is clamped to the pipe it's pretty ridged as in one piece. The muffler rubber mount at the passenger peg area provides a flexible attachment to absorb the engine's shaking. As mentioned the pipes are well secured at the head due to the amount of tightening required to hold rings from loosening. What's the purpose of another flexible mount at the pipe/muffler junction? Mine run loose in the muffler due to the type of clamp that is used by the factory. Has a built in sliding capability. I have never touched the clamping rings on the head. There you go , easy fix. There is no problem, and a search or recent threads will reveal a discussion about this issue. I am begining to see why some are getting frustrated with the forum at the moment. Steve - I have never seen this mentioned. so I should post another thread about wet sumping? my frustration is with people who attack others, not recurring issues. Yes - I know the exhaust nuts need to be tight. Yet excessive vibration from support at just two points over a length of 8 feet or so seems to me to be lacking. There is a perfectly good frame at the half-way point to provide another vibration-damping and support point. why not use it? I think one of the problems with exhausts of any kind is that they can change shape when heated up. All exhausts are usually flexibly mounted for this reason. To suggest adding another mounting clamp where the muffler joins would then also mean it would be necessary to support the muffler on its mid mounting, from a bracket which is fastened to the engine cradle, and it would still need to be mounted on rubbers. The front pipe is able to bend to accommodate the motion of the engine. I think the best answer to the problem it to make sure your front pipes remain secure in the heads. Using the original exhaust ring is a problem because it compresses. I would suggest using a solid gasket/ring and using exhaust sealer [ Maniseal in NZ is best ] to properly seal the joint. I am lucky with my 850 because a P.O. has welded a lug each side of the exhaust ports and fitted 5/16 studs. The exhaust flanges have be appropriately welded and drilled to accommodate the studs. The special nut used have a smaller hex [ 5/16 AF ] and are not ugly by any manner of means. I had an offer to repair the head with helicoils but because my front pipes never come loose, I have left it alone. My 850 is a workhorse though rather than a concourse bike. Concourse is the department of my 750. The original system should not come loose either if it is done up in a manner like I have described above. Completely missed that discussion (perhaps the title threw me and search off). Reviving this thread to ask a question about a bike I am looking at. This Commando features what appear to be clamps from header to the frame at the point just before the header pipe goes / curves horizontal and winds its way under the primary (L side) and gearbox (R side). This does not seem like a good idea to me, as the pipes need to flex with the engine as it shakes about. Is this modification factory, a former owner, or advice I have not heard of before? Thanks for any help on this. I have seen clamps that mount through the small hole in the bracket between the front iso and the crankcase, which is on the correct side of the iso. Bridging the isolastics would not be good. Man, I missed that one. Very nice. I assume it does away with the rubber mounts at the back? No, these were ‘extra’ supports, the necessity for which is subject to debate. Mounting point for peashooters is a lot further back, and therefore still required. Ludwig made a cradle mounted bracket that did away with stock Z plates and associated detritus. Very neat, as one would expect. Any pics of Ludwigs setup Nigel? No, very soft mounts used. 30,000 miles later, the brackets are working well. A little off topic, but maybe we could use a laugh. While working at a Norton, Triumph, Bultaco, and Guzzi shop in the early 70's the hot setup was to do away with the Triumph baseball bat mufflers and replace them with what was called a shorty muffler. I think they were from Bates. They looked cool and added a little snort. They came with a chrome steel mounting bracket that was about 6" long with a hole at each end. The muffler had a threaded lug welded to it (bolt). 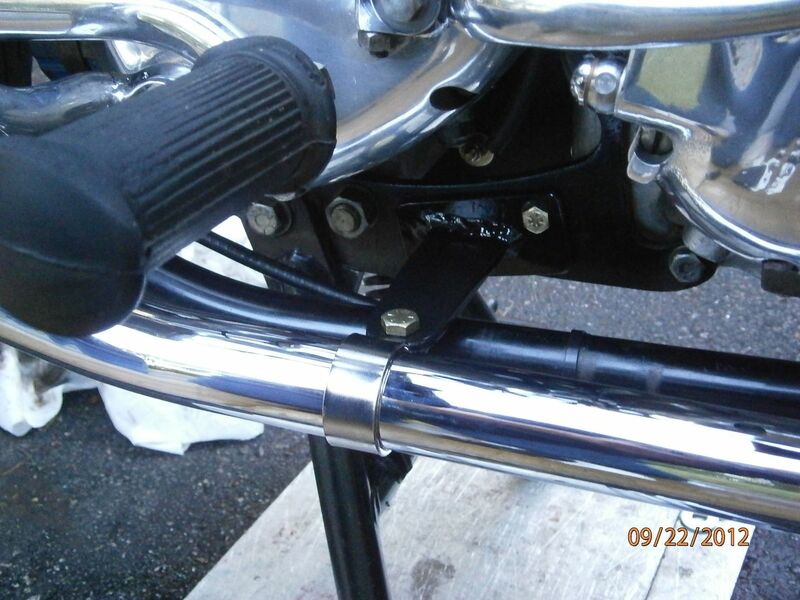 This bracket (strap) was just about the right length to reach the bottom shock mount bolt. We would get the call from the owner saying that his bike was making strange noises when going over a bump. The worst part was having to tell him what the problem was without emphasizing the fact that he was an idiot. MichaelB, Fast Eddie and norton73 like this.